Anyone with a fish fetish and a pair of binoculars can get a postcard-worthy peak of the Monterey Bay. But to truly appreciate one of the planet’s most diverse ecosystems, you’ll need to go a bit deeper. Local writer Tony Palumbi, co-author of The Extreme Life of the Sea, shines a light on the spooky fish, bone-eating worms, and success stories that lurk beneath the surface. What makes Monterey Bay so extreme? There are a huge number of habitats in what’s essentially a pretty small place. First of all, you’ve got a rocky coastline with all of these amazing tide pools; and then in the open water you have a mile-deep chasm, which opens up a whole new range of other habitats. Plus, it’s one of the few places on the West Coast where whales are regular visitors. Because it’s so deep and so cold, whales not only migrate through the bay, but stay to feed on krill and anchovies. Inevitably, some of the older whales die here. A dead grey whale, once it reaches the bottom of the bay, can feed an entire ecosystem for several years. We’ve actually seen a specific kind of worm called Osedax mucofloris, which translates to “bone-eating snot flower.” This goopy worm has adapted to live off the bones of dead wales. It may be a little creepy but you don’t end up with successful big animals until you have successful small animals. What’s the strangest deep-water dweller? One of the most peculiar creatures we talk about in the book is the Barreleye, or the Macropinna microstoma. It’s only a few inches long and it lives about 2,000-feet deep, where it feeds on jellyfish. It approaches the jellyfish from the bottom, where the tentacles are, so it would get stung in the head and eyes. 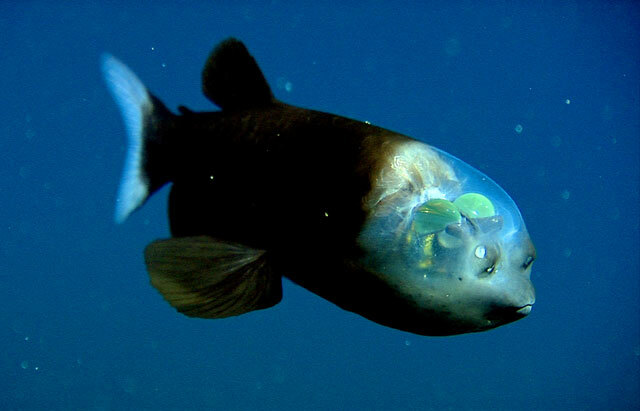 The way the fish has adapted is by literally pulling its eyes inside of its head. At the same time it’s made the top of its skull transparent, like a canopy to look through. It’s a completely bizarre creature that does something no other animal on the planet does for one fairly mundane reason: It makes it a little easier to eat jellyfish without getting its eyes stung. We’ve only discovered a fraction of the species in the deep, let alone described them in adequate detail. There are lots but the sea otter’s story is remarkable. Otters live in very cold water, and unlike whales and seals, they don’t have a protective layer of fat. Instead they adapted by developing incredible fur coats and insane metabolisms. Once people saw those coats, they nearly wiped them out. But it was their ferocious metabolisms that were crucial to the entire ecosystem of West Coast kelp forests. Once we stopped killing otters, they could continue their feeding frenzy on all the sea urchins and abalone that were restraining the kelp forests. So those two adaptations to cold turn out to tell the entire story of the otter, and a large part of the story of the Monterey Bay.